Posts tagged "Ice Cream Bunny"
RiffTrax burst back to theaters to bring us a new take on an old classic, with Santa and the Ice Cream Bunny. But, instead of the familiar Thumbelina insert, instead we got Jack and the Beanstalk, which turned out to be not only way more ridiculous and cheap than Thumbelina, but actually more enjoyable! Strange, I know. Along with the film we had three shorts that ratcheted up the Christmas crazy while having increasingly less to do with Christmas as they went along. Like most of the RiffTrax Live shows, it was recorded live on stage and broadcast throughout the country. This is also the first time Todd from Die Danger Die Die Kill and I were both free to watch a RiffTrax Live together in over a year, and it was a fitting return. This was one of the best RiffTrax Life shows, packed with hilarious riffs, hilarious shorts, and a movie that deserved every sling and arrow fired at it. If you have never suffered through the cinehorror monstrosity that is Santa and the Ice Cream Bunny, then you are a lucky mofo! The rest of us have been suckered in through all the “love of bad movies” thing and wound up hitting the wall. Santa and the Ice Cream Bunny is a wraparound story designed to house a different movie in between to fill time, the wraparound designed to advertise the 1960s amusement part Pirates World, which was located in Dania, Florida, until this place called DisneyLand opened up and destroyed them. Santa and the Ice Cream Bunny is impossible to describe in proper terms just how awful it is. A scrawny Santa stews in a filthy suit sitting in a sleigh on the beach in the hot Florida sun. Apparently, the sleigh is trapped and the reindeer ran off, so he entices a group of local kids to help him by psychically commanded them by song. The children bring a parade of rented animals to try to yank the sleigh out, including a guy in a gorilla suit. Watching the action for reasons never explained is Tom Sawyer and Huck Finn. The madness continues only a few minutes longer before Santa breaks into a story, the story being a completely different movie. The version of Ice Cream Bunny that has seen the widest release features Barry Mahon’s Thumbelina, which is ridiculously long and boring (even the RiffTrax VOD version released years ago had to trim it down! ), but this version featured Barry Mahon’s Jack and the Beanstalk. If you are familiar with Barry Mahon’s children movie work (as opposed to his nudie cutie work), then you remember most of them are basically filmed stage plays with budgets in the tens and tens of dollars. Jack and the Beanstalk is no exception, and yet it is somehow way more entertaining than Thumbelina. Then we get to the main cinematic yule log, log being of the kind of logs you flush down the toilet! Bathroom humor, folks! The junk. Jack and the Beanstalk takes place in a storyland that features costumes that are Ren Faire meets Brady Bunch and what appears to be three sets on the same sound stage (complete with painted cloth backgrounds), the film follows the normal Jack and the Beanstalk plot, though claims the golden hen and magic harp Jack steals were previously owned by his father, and the family somehow didn’t notice a giant burgling their house. Of special note here is that the golden hen isn’t an actual hen, but a papier-mâché creation roughly in the shape of a hen with golden paint covering it. This is a slight bit better than the magic harp, which is lumpy papier-mâché with gold paint and uneven strings, which makes it look like how Tim Burton would draw a stove. Jack and the Beanstalk is a musical, and the characters will randomly burst into song. This is most jarring with the giant, who spends his time chewing the scenery as a tough giant who yells at his wife for dinner and yells his declarations of taking a nap, but will then suddenly breaking into perfectly operatic renditions of “Fee Fi Fo Fum”. The Santa and the Ice Cream Bunny segments are directed by R. Winer – which is totally not an acronym for someone who wanted to keep his name far away from this thing! It’s the only thing credited to him, and the name is too generic to do a good records search. A mystery for the ages, because almost no one cares. 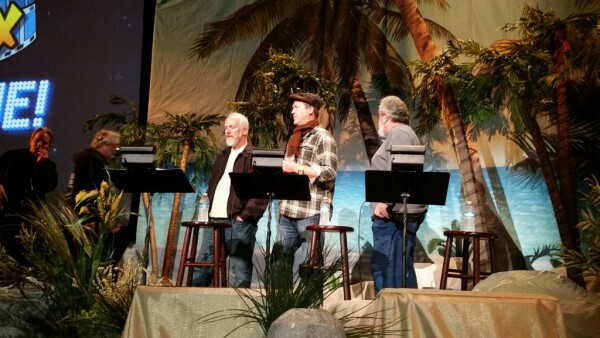 The Riffs were ON POINT, this is the most I’ve laughed at a RiffTrax Live event that I can remember. Favorite riffs include the quip about the “man hand scooping” and the “HUURRRRRRR HUUURRRRRR HURRRRRRRR” sounds as Ice Cream Bunny goes full crazy. Seriously, by that point the film does most of the work, the riffs being icing on the cake. My only complaint is it is missing one of my favorite jokes from the VOD version, when the gorilla appears, Mikes reminds us that this was Plan A. But that is an extremely minor quibble, and this RiffTrax Live is definitely a new Christmas Classic for one and all!